Honestly, if they are rewriting history to blame "climate change" their theories are garbage. 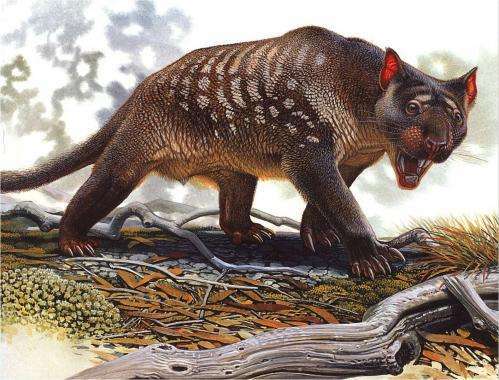 "there is only firm evidence for about 8 to 14 megafauna species still existing when Aboriginal people arrived." 8 to 14. Sounds like climate science to me. Can't get an accurate number from them. "About 50 species, for example, are absent from the fossil record of the past 130,000 years." About 50? Why not 42 to 58? They can't even decide whether 8 or 14 or in between were alive at one point, but are sure that 50 weren't there? this is the stupidest article ever. mankind hunted the same PREY that the big predators relied upon EXCLUSIVELY for their diet. there is not direct manner in which it can be proven that we starved out other predator species. it is a fact that primitive man hunted large quantities of large mammals----elephants and plains animals. and yet---we are to believe other pedator species did not suffer from this. we are , and were always part of the evolutionary landscape of large predator species. we have ALWAYS competed with other species and will NEVER know precisely how, but our scientists can take a guess. mankind driving other species to extinction is a fact many people feel uncomfortable reckoning with because they don't accept our existence as mere animals in competition with other animals. civilization has given them a false sense of superiority. imagine living with no tools you couldn't build yourself from rocks and wood. then see how you feel about a pack of wild dogs on the road. There are a couple of aboriginal paintings thought to be of megafauna, but they're old and degraded. The early indigenous people probably would've seen some of these animals. Is this paper meant to be introducing a new theory of sorts or just swinging off the back of current climate change fear-mongering and taxing (see Australia's carbon tax)? Also apparently the water is rising to swallow small islands yet it hasn't risen so much as 1mm on beaches anywhere else funnily enough - yes I live near a beach. Then again there's a new sucker born every minute on the internet so churning stories out like this has a whole fresh new audience every day. They have only guesses about any of this stuff. Make a guess test it if you can with little or no evidence, guess at what the evidence actually shows...change the guess. Too bad the ancients forgot to take notes. Who were those evil humans that caused the climate change 50,000 years ago? Actually I like this theory as it shows what we all know, that the climate has always changed. Please define "large quantities", and just how many of the "primitive man" do you figure there really were at any given time? Of course the multitudes of primitive mankind also hunted to extinction African and Indian elephants, rhinos, hippos, wildebeest, bison, deer, moose, llama, water buffalo, walrus and seals ... Man destroyed all of them, right? Who taught so many out there to be self-loathing, city-dwelling morons who somehow think that they understand how nature works and with no sense of time? Technology enabled us to hunt the creatures that were hunting us, thereby eliminating a major attritive element. Our numbers subsequently exploded and the tribal dynamic - internal altruism vs external animosity - became the main selector for human development. It gave us these large unwieldy, delicate, defect-prone, and unsustainable brains. Of course we wiped out the megafauna. We set the fires which drove their herds off cliffs and into canyons where they could be slaughtered en masse. We built huts from their bones. even of a tool-kit that was appropriate for big-game hunting," he said.